Nigel and his wife are the pioneers of long-range island excursions. In their very professional way, they have arranged for a super tour which begins with an eye-opening experience of power boating taken to its limits. The 55-minute ride brings you to Allan's Cay. After your "iguana greeting" you can stroll around and feed these descendants of the dinosaur. This is the only place that the rare Bahamian iguana resides. On to the private island for the balance of your day. You have so many choices on how to spend it but enough time to do everything. Perhaps a guided nature walk, which will allow you to see ospreys, egrets, hummingbirds, and the local wild boar. You will also be introduced to a little bush medicine. And then, if you are game, you can watch the Captain and the crew feed the sharks. You can be safely snapping shots just a few feet away on a cottage deck. Lunch is about ready now; the scent of BBQ fish has reminded you that it is time to eat. Lunch includes an open bar, salads, fruits, breads, and more. And don't forget to snorkel after you take a nap on the beach. 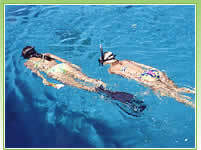 These particular reefs are protected by the Bahamas National Trust and they are pretty isolated. That means that colorful fish are in abundance and you will be able to see things that you never saw before. Bring your beach towel, swimsuit, dry clothing and sunblock. Transfers from your hotel are included. If you are coming off a cruise ship, you will need to take a 10 minute taxi ride. No one under age 2. No pregnant women. No one with back, neck or spinal conditions. This is extreme! Please be aware that not many cruise ships are in port long enough to take this trip. Make sure the times work with your ship before signing up.